The early history of the First Parish Church of Duxbury, Massachusetts, is central to the overall history of Duxbury. A succession of four buildings, including the present one, constitutes the framework. By 1632, a group of Pilgrim settlers, led by Elder William Brewster, had left their small farms at Plymouth for larger lots on the neck of land across Duxbury Bay. 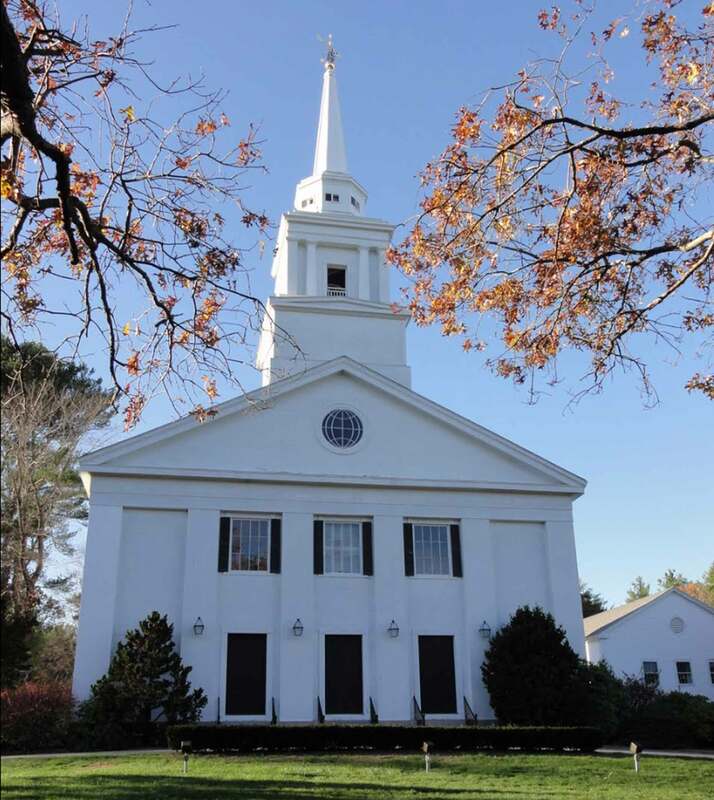 This developing congregation was to become First Parish in Duxbury, the second religious body of the Plymouth Colony. In the early days of this Duxbury settlement, the center of the community was in The Nook, a fertile, spring-fed area between Captain’s Hill and Bay Road, directly accessible by boat from Plymouth. Meetings probably were held in houses, primitive buildings similar to those seen today at Plimoth Plantation. The requirements that the town’s proprietors had to fulfill before receiving title from the colonial authorities were to attract a minimum number of settlers, hire a minister and erect a meeting house within a specified number of years. Such “parishes” as they were called, were also required to have a school teacher often the minister — and sometimes a public burying ground. The Reverend Ralph Partridge was the first ordained minister. He assisted the aging Elder Brewster and officially became their leader in 1638. It was probably then that the First Meeting House was built on Chestnut Street, beside the present Old Burying Ground. The larger Second Meeting House replaced it in 1708. Duxbury had become incorporated, June 17, 1637, and included Pembroke, parts of Marshfield, Kingston and Bridgewater. Gradually the center of the settlement began to move westward from the Nook. By 1784 the town had voted to replace the second Meeting House with a finer new (Third) building, to be built near the present site, at the junction of Tremont and Depot streets. In 1787, the Third Meeting House, a grand square building of the Georgian style, was constructed and painted in “yellow oker.” By 1819 a cupola had been built, and alterations were made for seats for “people of color” and “singers.” A bell had been hung and a clock was presented by Ezra Weston, a successful shipbuilder and merchant. Duxbury’s first three meeting houses housed civil as well as religious functions for almost 200 years. By 1833, the (First Parish) society legally ceased to be the village parish. The official Massachusetts separation of church and state took place a few months later in 1834. Religious change had begun to reshape the town. New churches had been built along Washington street; Methodist Episcopal in 1823, Universalist in 1826 and by 1844 Wesleyan Methodist. First Parish became the First Unitarian Parish on March 3, 1828. It continued to use the community’s Third Meeting House until 1840, when the Third Meeting House was razed and the Unitarian Church, the fourth building was constructed near its site. Temple-like in form, an example of the popular Greek Revival style of the period, it was the first of three buildings in the same architectural style that were built in a row on the hill. The other two were town buildings; the new “Town House” (the present Old Town Hall), was completed the same year, 1840. The town’s school, Partridge Academy, opened in 1844 and burned in 1934. The current town hall was built on the Partridge Academy site and dedicated July 4, 1975. Interesting features abound in the Sanctuary.